A couple years ago, I used TripAdvisor or Yelp to learn about new restaurants in my area. Nowadays, I use Google Maps as the primary decision-maker, instead. If I’m on my phone, I’ll simply open the Maps app and click the “Food” or “Drinks” icon to begin perusing options near me. More than likely, most users will find what they’re looking for within the Google Maps results, and won’t even scroll to the organic results underneath — which is why it’s critical you optimize your website to appear on Google Maps. 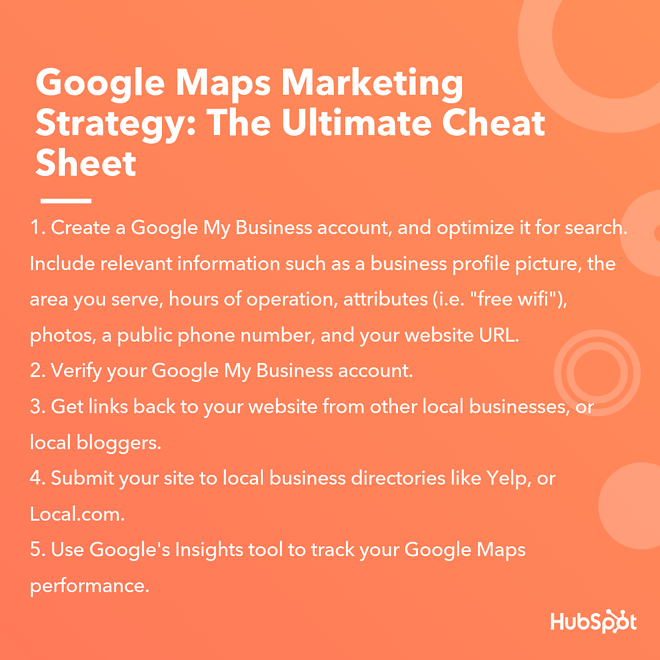 Here, we’re going to cover how you can optimize your Google My Business account to ensure you appear on Google Maps, as well as marketing tactics you can employ to improve your local SEO. To appear in Google Maps, you’ll need to create a Google My Business account and ensure all the information is up-to-date. Once you’ve created a profile, it’s critical you include as much relevant information as possible — including a business profile picture, the area you serve, hours of operation, attributes (i.e. “free wifi”), a public phone number, and your website URL. Additionally, according to Google, businesses with photos receive 42% more requests for driving directions to their location, and 35% more click-throughs to their website. To optimize your account for search, then, it’s vital you provide pictures of your physical store as well as images of your products or services. Google also recommends responding to online reviews of your business, which enables new people to find you online, and also demonstrates to existing customers that you value their feedback. You might consider asking happy customers to leave reviews, or even incentivizing them with a coupon in exchange. Alternatively, if someone leaves a negative review, it’s still important you respond. Look at Google’s guidelines for how to respond to a negative review. To learn more about how to optimize your Google My Business account, check out The Ultimate Guide to Google My Business. Google Maps is the most popular navigation app by a landslide, with 67% of total navigation users — second to Maps is Waze, with only 12% of total users. This means it’s a critical tool for ensuring local consumers can find your business. Google Maps can help bolster your online presence in local search results, which demonstrates your legitimacy and relevancy as a company — you wouldn’t be able to rank #1 for “nail salons near me” if you’d closed down months ago. Additionally, ranking high in search will ideally convince consumers to choose your business over a competitor’s. 1. Get links back to your site from local businesses or bloggers. To improve your local SEO, consider crafting a strategy to get links back to your site from other local businesses. You could create a deal in which you link to another business’ site in exchange for a link from them. Alternatively, depending on your industry, try reaching out to local bloggers to ask for reviews — for instance, if you run a Bed & Breakfast, you might ask travel bloggers to stay for free in exchange for an online review. 2. Submit your site to local business directories. Try submitting your site to local business directories like Yelp, Local.com, and Superpages, and ensure all information across each of the sites is accurate — ultimately, the more websites that reference your business, the better. To submit your site to Yelp, for instance, go to https://biz.yelp.com/signup_business/new and fill in the form. Once the site is verified and approved by moderators, you’ll receive an email on how to claim your business page. 3. Keep track of performance via Google’s Insights tool. Once you’ve created a Google My Business profile and optimized it for Google Maps, you’ll want to track analytics using Google’s Insights tool. To access Insights on a desktop, sign into your Google My Business account, open the location you’d like to manage (if you have multiple locations), and click “Insights” from the menu. On mobile, open the Google My Business app, click “More”, and then tap “Insights”. Insights allows you to see how many times people have seen your business information, how many times people have requested driving directions to your location, and how customers are able to find your listing.